BACKGROUND: Current recommendations for spinal tuberculosis (TB) not requiring open surgery include core needle biopsy to confirm TB and determine drug sensitivity. International figures show the positive culture yield from core needle biopsies is 50 - 83%. OBJECTIVES: To (i) assess the yield of percutaneous needle biopsies; (ii) identify factors that may lead to a negative result; and (iii) determine whether, TB being suspected, needle biopsy is justified. METHODS: We conducted a multicentre retrospective review of 44 patients treated for suspected spinal TB between January 2009 and April 2012, who did not require open surgery. Data captured included demographics, relevant history, outcome of investigations and histopathological findings in patients. RESULTS: The overall positive TB culture rate was 59%. Age, duration of symptoms, HIV and neurological status, erythrocyte sedimentation rate and core size had no statistical influence. Of the 7 patients receiving TB treatment at the time of biopsy, 3 were culture-positive. Multidrug resistance was evident in 12% of positive cultures. 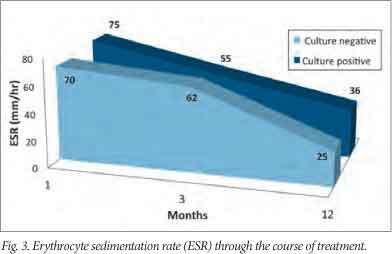 The positive culture yield was 40% at Tygerberg Hospital and 75% at Groote Schuur Hospital, with no difference in histological yield. This was attributed to the practice of decontaminating specimens prior to culture at Tygerberg Hospital. The highest culture yield (32%) came from samples showing non-necrotising chronic inflammatory changes. CONCLUSION: Percutaneous biopsy remains an important tool to diagnose and manage spinal TB. The yield of transpedicular biopsies in this study was comparable with international figures. Specimen decontamination prior to culture had a direct negative influence on biopsy culture yield, as did prior TB treatment. It has been estimated by the World Health Organization (WHO) that a third of the world's population is infected with Mycobacterium tuberculosis (MTB), with a tuberculosis (TB) incidence of 981/100 000 in South Africa. Of TB infections, 16% involve extra-pulmonary systems and 1% affect the spine. Alarmingly, of all patients treated for spinal TB, only 55% have a definitive laboratory diagnosis, with 19% being negative and 26% having no traceable results. Although effective chemotherapy has been available for over 50 years, TB remains one of the most challenging diseases to manage. Timely diagnosis and adequate treatment of spinal TB are necessary to prevent serious morbidity, including spinal deformity and, ultimately, neurological sequelae. Spinal cord compression from pus, inflammatory granulation tissue of active disease, or kyphosis deformity in the late stage of disease can result in paraplegia. As the majority of cases are managed medically, a reliable confirmation of spinal TB diagnosis is crucial. We performed a retrospective, multicentre review of 44 consecutive patients who presented at Tygerberg Hospital (TBH) or Groote Schuur Hospital (GSH) between January 2009 and April 2012 and had clinical and radiological evidence of spinal TB. All had undergone percutaneous transpedicular needle biopsy to confirm diagnosis and were identified from surgical databases kept by their respective surgeons. All patients had strong clinical and radiological evidence of TB and had magnetic resonance imaging (MRI) scans as part of their workup (Fig. 1). Exclusion criteria included absolute indications for further surgical management and questionable diagnoses where biopsy was undertaken to rule out non-infectious processes. Patients waited an average of 11.9 days prior to biopsy, allowing for full workup. There were 20 males and 24 females, ranging in age from 16 to 89 years (mean 39 years). All had a history of lower back pain, with an average 6-month duration of symptoms prior to presentation. On examination, 24 (54%) had a neurological deficit ranging from sensory fallout to myelopathy with muscle weakness. Nearly half had constitutional symptoms of TB, including weight loss, night sweats, loss of appetite and general malaise. Fourteen patients were HIV-positive, 21 HIV-negative and the rest refused testing. Seven of the HIV-positive patients were established on antiretroviral treatment (ART), and none had any other AIDS-defining disease. Six patients had a history of previous TB, of whom 4 were HIV-positive. As all subjects were referred from secondary level institutions, 7 had already been started on the 4-drug TB treatment regimen, with a varying duration of treatment at presentation (5 - 70 days). Included in the initial blood workup was the erythrocyte sedimentation rate (ESR), a nonspecific inflammatory marker often elevated in TB, measured using the Westergren method. The ESR ranged from 3 to 150 mm/hour (mean 72 mm/hour). All patients had plain X-rays of the chest and spine in the initial radiological workup. 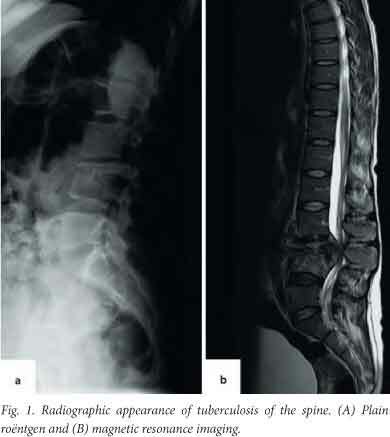 Spinal radiology revealed typical features ranging from osteopenia, paravertebral abscess and disc space reduction to end plate erosions and vertebral body collapse. On MRI, 21 patients had abscess formation, which was epidural in 8 and pre-vertebral in 13. One patient had arachnoiditis. Five patients had disease involving more than 2 vertebrae. At the time of biopsy, patients were given a general anaesthetic and either positioned prone or on their right side. 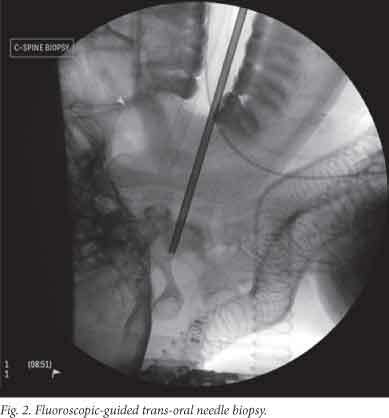 A Jamshidi or Harlow Wood needle was advanced percutaneously under fluoroscopic guidance into the affected vertebral body, utilising the transpedicular approach. Almost all patients had either a thoracic or lumbar biopsy. In 2 patients, cervical spine biopsy was achieved via a transoral approach for atlanto-axial pathology (Fig. 2). A pus sample and 2 trephine biopsies of bone (average length 7.92 mm) were collected from each patient. All samples underwent histopathological examination, microscopy and culture, and polymerase chain reaction (PCR) analysis for MTB DNA. The gold standard for the definitive diagnosis of TB remains the identification of MTB; therefore, all results were measured against a positive or negative culture. To identify factors influencing the overall culture yield of biopsies, the study population was split into 2 groups: culture-positive and culture-negative. Of the 44 patients, 26 (59%) had biopsies that cultured positive for TB. Age, duration of symptoms, HIV status and neurological status had no statistical influence on this outcome of culture positivity. There was no statistical significance when comparing the average ESR values of the culture-positive and -negative groups (mean 69.7, standard deviation (SD) ±37.5 v. 74.8±37.6, respectively). However, there was a definite downward trend in ESR from commencement to completion of treatment in both groups (Fig. 3), with patients being treated for an average of 12.4 months (mean 12; SD ±4; range 12 - 24). The classic histological finding is one of necrotising granulomas with epithelioid macrophages, multiple giant cells and lymphocytes. Because this picture can change in HIV-positive individuals, non-necrotising granulomatous inflammatory changes may also be found in TB culture-positive specimens. Fig. 4 shows the comparison between the histology and the culture results of the same specimen. Unexpectedly, the highest culture yield came from samples showing non-necrotising chronic inflammatory changes (32%), followed by samples with nonspecific histological findings (27%) and not from samples showing necrotising granulomas. Samples showing classic TB histology were associated with a positive culture in only 23% of cases. Only 2 specimens stained positive for acid-fast bacilli and of the 59% of positive cultures, 12% were multidrug resistant (MDR). All drug sensitivities were confirmed with PCR. Biopsy core length had no significant impact on culture yield. The negative group, in fact, had the largest average core size (mean 9 mm v. 7 mm) (Fig. 5). A possible explanation is that these larger core sizes were due to removing the trocar too soon, thereby sampling a greater proportion of healthy pedicular bone. The potential effect of active TB treatment on culture yield was of concern. Seven patients were receiving TB therapy by the time of spinal biopsy, 3 of which were culture-positive. Although a trend towards positive culture in patients not yet started on TB treatment could be identified, this was not statistically significant (p=0.0518, Fisher's exact two-tailed test). There was a similar histological yield of the biopsies between the individual hospitals (56%). Of the 44 samples, 10 were diagnostic and 13 were suggestive of TB infection (but showing non-necrotising granulomatous inflammation). There was, however, a significant difference in the yield from culture despite the biopsies being performed by the same surgeons at both hospitals: positive results at TBH only reached 40% compared with 75% at GSH. On examining the standard operating procedure (SOP) at the TBH National Health Laboratory Service (NHLS) laboratory, it was found that all samples were routinely decontaminated before being prepared for culture, leading to loss of viable bacilli and a lower culture yield. The SOP at GSH NHLS laboratory differed in that core specimens were treated as sterile and only decontaminated when they were flagged as growing other bacteria. This was brought to the attention of the relevant microbiologists, who have since changed their practice. There is no single test that can be performed for the detection of all musculoskeletal cases of TB. The diagnosis of spinal disease remains a challenge. The treating physician must have a high index of suspicion and has to rely on observation and thorough investigation of clinical signs and symptoms, augmented by the use of various imaging techniques and laboratory methods. Patients may complain of back pain, night sweats, loss of weight and appetite. They may also have neurological symptoms ranging from clumsiness, with subtle myelopathic signs, to complete motor fallout. In active TB, a low haemoglobin level, relative lymphocytosis and a raised ESR may be found. [5,6] Because these are all nonspecific findings, results serve only to support the diagnosis. Ultimately, identification of the TB bacilli in biopsy specimens offers the only definitive diagnosis. [7,8] The gold standard remains the culture of MTB, it is much more sensitive than smear microscopy and can detect as little as 10 viable MTB bascillus per millilitre of sample. In spinal disease, this unfortunately requires the invasive procedure of bone biopsy, the diagnosis being made histologically when necrotising granulomatous inflammation showing epithelioid macrophages, multiple giant cells and lymphocytes are demonstrated. In patients with HIV, and more specifically AIDS, the histological changes caused by MTB can range from the classic caseating granulomas, to a nonspecific chronic inflammatory reaction without necrosis. Ziehl-Neelsen staining is then key to the identification of the presence of acid-fast bacilli. Regrettably, because of the typically low bacterial loads in TB of the spine, bacteria are only identifiable in <50% of cases using minimally invasive techniques. Moreover, confirming the diagnosis histologically is but half the battle, as sensitivity to first-line drugs still has to be proven. In endemic areas, the diagnosis of spinal TB is often made on clinical suspicion, radiographic evidence and blood-test results alone, and treatment is started empirically. [5,10] Danchaivijitr et al. identified patients with spinal TB based on either histopathological, microbiological or typical radiological findings and showed good response to anti-TB treatment in all 3 groups. At a time when drug resistance is growing at an alarming rate, and with TB being the great mimicker, it is important to have a histopathological diagnosis together with a drug sensitivity profile to achieve a definitive diagnosis and treatment. [10-12] MDR-TB is estimated to account for 1.8% of new TB cases and 6.7% of re-treatment cases. The current guidelines for the management of spinal TB include percutaneous vertebral needle biopsy as a diagnostic tool before treatment is started'101 to confirm MTB as the responsible pathogen and its sensitivity to first-line treatment. A recent meta-analysis that focused on core needle biopsy to achieve TB diagnosis revealed an overall TB culture yield of 66% (range 50 - 83) in 299 biopsies. A retrospective study in 2005 focused on 70 adult patients with clinico-radiological proof of thoracic spinal TB. Computed tomography (CT)-guided needle biopsies were performed in 11 cases - 3 yielded positive cultures for TB and 5 showed evidence of TB on histology. All 3 culture specimens showed resistance to first-line drugs. Another 10 of the 70 patients in this study failed to respond to firstline TB treatment and were diagnosed with MDR-TB by default and subsequently successfully treated. Although systematic follow-up and continuous monitoring can ensure that such resistant cases are ultimately detected, not testing for drug susceptibility risks a delay of between 7 and 8 months before institution of appropriate therapy. It is important to scrutinise biopsy results and to be aware of the techniques used in the processing of samples by the respective microbiology laboratory. In this study, there was clearly an inconsistency in the results obtained from the respective laboratories, with the difference identified in the TBH NHLS SOP of decontaminating biopsy samples prior to culturing for TB. This procedure is meant to selectively eliminate bacteria other than mycobacteria and makes use of sodium hydroxide-N-acetyl-L-cysteine to liquify samples. A phosphate buffer is then added to the mixture, which is then concentrated by centrifugation. The supernatant is decanted, leaving the sediment to be cultured. Prior to inoculation into the MTB growth indicator tube (MGIT), an antibiotic mixture, referred to as PANTA, is added to the culture broth. PANTA comprises 5 antimicrobial agents: polymyxin B, amphotericin B, nalidixic acid, trimethoprim and azlocillin. The addition of this antibiotic mixture has been found to increase rather than decrease MTB culture yields. Thus, the most obvious explanation for the loss of viable bacilli would have to be the dilution and increased decanting of the specimen by the addition of PANTA. Extra N-acetyl-L-cysteine powder would have had to be added to adequately liquefy the core biopsy sample, which in turn meant more phosphate buffer and consequently more supernatant requiring decanting. Both laboratories now practise direct inoculation into a MGIT tube without adding any PANTA, and decontamination is only performed if the specimen appears to be growing bacteria other than mycobacteria. Compared with published data, the overall yield from needle biopsies performed in this study is commensurate with international experience. The factors that could be identified as having directly influenced biopsy yield were two-fold, i.e. that the patient was receiving TB treatment at time of biopsy and the routine practice of decontaminating specimens prior to culture. The results of this study suggest that every patient with a clinical and radiological suspicion of spinal TB should undergo core needle biopsy in the diagnostic workup. Where TB treatment has already been initiated, the surgeon should recognise the probability of a negative MTB culture. Such patients may be treated empirically and only be biopsied when there is suspicion of drug resistance or non-infective pathology. Acknowledgements. We acknowledge Professor Robert Dunn for the use of the surgery database at GSH.